The nervous system can be divided into two functional parts: the somatic nervous system and the autonomic nervous system. The major differences between the two systems are evident in the responses that each produces. The somatic nervous system causes contraction of skeletal muscles. The autonomic nervous system controls cardiac and smooth muscle, as well as glandular tissue. The somatic nervous system is associated with voluntary responses (though many can happen without conscious awareness, like breathing), and the autonomic nervous system is associated with involuntary responses, such as those related to homeostasis. The autonomic nervous system regulates many of the internal organs through a balance of two aspects, or divisions. In addition to the endocrine system, the autonomic nervous system is instrumental in homeostatic mechanisms in the body. The two divisions of the autonomic nervous system are the sympathetic division and the parasympathetic division. The sympathetic system is associated with the fight-or-flight response, and parasympathetic activity is referred to by the epithet of rest and digest. Homeostasis is the balance between the two systems. At each target effector, dual innervation determines activity. For example, the heart receives connections from both the sympathetic and parasympathetic divisions. One causes heart rate to increase, whereas the other causes heart rate to decrease. Watch this video to learn more about adrenaline and the fight-or-flight response. When someone is said to have a rush of adrenaline, the image of bungee jumpers or skydivers usually comes to mind. But adrenaline, also known as epinephrine, is an important chemical in coordinating the body’s fight-or-flight response. In this video, you look inside the physiology of the fight-or-flight response, as envisioned for a firefighter. His body’s reaction is the result of the sympathetic division of the autonomic nervous system causing system-wide changes as it prepares for extreme responses. What two changes does adrenaline bring about to help the skeletal muscle response? To respond to a threat—to fight or to run away—the sympathetic system causes divergent effects as many different effector organs are activated together for a common purpose. More oxygen needs to be inhaled and delivered to skeletal muscle. The respiratory, cardiovascular, and musculoskeletal systems are all activated together. Additionally, sweating keeps the excess heat that comes from muscle contraction from causing the body to overheat. The digestive system shuts down so that blood is not absorbing nutrients when it should be delivering oxygen to skeletal muscles. To coordinate all these responses, the connections in the sympathetic system diverge from a limited region of the central nervous system (CNS) to a wide array of ganglia that project to the many effector organs simultaneously. The complex set of structures that compose the output of the sympathetic system make it possible for these disparate effectors to come together in a coordinated, systemic change. 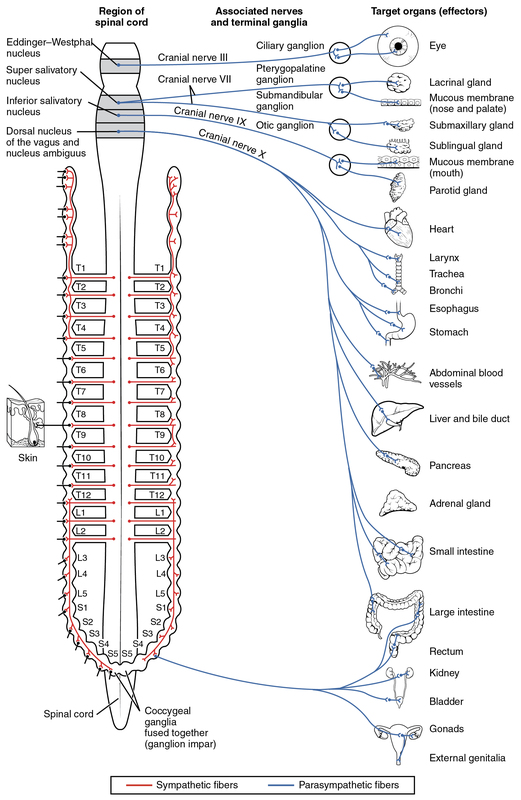 The sympathetic division of the autonomic nervous system influences the various organ systems of the body through connections emerging from the thoracic and upper lumbar spinal cord. It is referred to as the thoracolumbar system to reflect this anatomical basis. A central neuron in the lateral horn of any of these spinal regions projects to ganglia adjacent to the vertebral column through the ventral spinal roots. The majority of ganglia of the sympathetic system belong to a network of sympathetic chain ganglia that runs alongside the vertebral column. The ganglia appear as a series of clusters of neurons linked by axonal bridges. There are typically 23 ganglia in the chain on either side of the spinal column. Three correspond to the cervical region, 12 are in the thoracic region, four are in the lumbar region, and four correspond to the sacral region. The cervical and sacral levels are not connected to the spinal cord directly through the spinal roots, but through ascending or descending connections through the bridges within the chain. A diagram that shows the connections of the sympathetic system is somewhat like a circuit diagram that shows the electrical connections between different receptacles and devices. In [link], the “circuits” of the sympathetic system are intentionally simplified. To continue with the analogy of the circuit diagram, there are three different types of “junctions” that operate within the sympathetic system ([link]). The first type is most direct: the sympathetic nerve projects to the chain ganglion at the same level as the target effector (the organ, tissue, or gland to be innervated). An example of this type is spinal nerve T1 that synapses with the T1 chain ganglion to innervate the trachea. The fibers of this branch are called white rami communicantes (singular = ramus communicans); they are myelinated and therefore referred to as white (see [link]a). The axon from the central neuron (the preganglionic fiber shown as a solid line) synapses with the ganglionic neuron (with the postganglionic fiber shown as a dashed line). This neuron then projects to a target effector—in this case, the trachea—via gray rami communicantes, which are unmyelinated axons. In some cases, the target effectors are located superior or inferior to the spinal segment at which the preganglionic fiber emerges. With respect to the “wiring” involved, the synapse with the ganglionic neuron occurs at chain ganglia superior or inferior to the location of the central neuron. An example of this is spinal nerve T1 that innervates the eye. The spinal nerve tracks up through the chain until it reaches the superior cervical ganglion, where it synapses with the postganglionic neuron (see [link]b). The cervical ganglia are referred to as paravertebral ganglia, given their location adjacent to prevertebral ganglia in the sympathetic chain. Not all axons from the central neurons terminate in the chain ganglia. Additional branches from the ventral nerve root continue through the chain and on to one of the collateral ganglia as the greater splanchnic nerve or lesser splanchnic nerve. For example, the greater splanchnic nerve at the level of T5 synapses with a collateral ganglion outside the chain before making the connection to the postganglionic nerves that innervate the stomach (see [link]c). Collateral ganglia, also called prevertebral ganglia, are situated anterior to the vertebral column and receive inputs from splanchnic nerves as well as central sympathetic neurons. They are associated with controlling organs in the abdominal cavity, and are also considered part of the enteric nervous system. The three collateral ganglia are the celiac ganglion, the superior mesenteric ganglion, and the inferior mesenteric ganglion (see [link]). The word celiac is derived from the Latin word “coelom,” which refers to a body cavity (in this case, the abdominal cavity), and the word mesenteric refers to the digestive system. One type of preganglionic sympathetic fiber does not terminate in a ganglion. These are the axons from central sympathetic neurons that project to the adrenal medulla, the interior portion of the adrenal gland. These axons are still referred to as preganglionic fibers, but the target is not a ganglion. The adrenal medulla releases signaling molecules into the bloodstream, rather than using axons to communicate with target structures. The cells in the adrenal medulla that are contacted by the preganglionic fibers are called chromaffin cells. These cells are neurosecretory cells that develop from the neural crest along with the sympathetic ganglia, reinforcing the idea that the gland is, functionally, a sympathetic ganglion. The projections of the sympathetic division of the autonomic nervous system diverge widely, resulting in a broad influence of the system throughout the body. As a response to a threat, the sympathetic system would increase heart rate and breathing rate and cause blood flow to the skeletal muscle to increase and blood flow to the digestive system to decrease. Sweat gland secretion should also increase as part of an integrated response. All of those physiological changes are going to be required to occur together to run away from the hunting lioness, or the modern equivalent. This divergence is seen in the branching patterns of preganglionic sympathetic neurons—a single preganglionic sympathetic neuron may have 10–20 targets. An axon that leaves a central neuron of the lateral horn in the thoracolumbar spinal cord will pass through the white ramus communicans and enter the sympathetic chain, where it will branch toward a variety of targets. At the level of the spinal cord at which the preganglionic sympathetic fiber exits the spinal cord, a branch will synapse on a neuron in the adjacent chain ganglion. Some branches will extend up or down to a different level of the chain ganglia. Other branches will pass through the chain ganglia and project through one of the splanchnic nerves to a collateral ganglion. Finally, some branches may project through the splanchnic nerves to the adrenal medulla. All of these branches mean that one preganglionic neuron can influence different regions of the sympathetic system very broadly, by acting on widely distributed organs. The parasympathetic division of the autonomic nervous system is named because its central neurons are located on either side of the thoracolumbar region of the spinal cord (para- = “beside” or “near”). The parasympathetic system can also be referred to as the craniosacral system (or outflow) because the preganglionic neurons are located in nuclei of the brain stem and the lateral horn of the sacral spinal cord. The connections, or “circuits,” of the parasympathetic division are similar to the general layout of the sympathetic division with a few specific differences ([link]). The preganglionic fibers from the cranial region travel in cranial nerves, whereas preganglionic fibers from the sacral region travel in spinal nerves. The targets of these fibers are terminal ganglia, which are located near—or even within—the target effector. These ganglia are often referred to as intramural ganglia when they are found within the walls of the target organ. The postganglionic fiber projects from the terminal ganglia a short distance to the target effector, or to the specific target tissue within the organ. Comparing the relative lengths of axons in the parasympathetic system, the preganglionic fibers are long and the postganglionic fibers are short because the ganglia are close to—and sometimes within—the target effectors. The cranial component of the parasympathetic system is based in particular nuclei of the brain stem. In the midbrain, the Edinger–Westphal nucleus is part of the oculomotor complex, and axons from those neurons travel with the fibers in the oculomotor nerve (cranial nerve III) that innervate the extraocular muscles. The preganglionic parasympathetic fibers within cranial nerve III terminate in the ciliary ganglion, which is located in the posterior orbit. The postganglionic parasympathetic fibers then project to the smooth muscle of the iris to control pupillary size. In the upper medulla, the salivatory nuclei contain neurons with axons that project through the facial and glossopharyngeal nerves to ganglia that control salivary glands. Tear production is influenced by parasympathetic fibers in the facial nerve, which activate a ganglion, and ultimately the lacrimal (tear) gland. Neurons in the dorsal nucleus of the vagus nerve and the nucleus ambiguus project through the vagus nerve (cranial nerve X) to the terminal ganglia of the thoracic and abdominal cavities. Parasympathetic preganglionic fibers primarily influence the heart, bronchi, and esophagus in the thoracic cavity and the stomach, liver, pancreas, gall bladder, and small intestine of the abdominal cavity. The postganglionic fibers from the ganglia activated by the vagus nerve are often incorporated into the structure of the organ, such as the mesenteric plexus of the digestive tract organs and the intramural ganglia. Where an autonomic neuron connects with a target, there is a synapse. The electrical signal of the action potential causes the release of a signaling molecule, which will bind to receptor proteins on the target cell. Synapses of the autonomic system are classified as either cholinergic, meaning that acetylcholine (ACh) is released, or adrenergic, meaning that norepinephrine is released. The terms cholinergic and adrenergic refer not only to the signaling molecule that is released but also to the class of receptors that each binds. The cholinergic system includes two classes of receptor: the nicotinic receptor and the muscarinic receptor. Both receptor types bind to ACh and cause changes in the target cell. The nicotinic receptor is a ligand-gated cation channel and the muscarinic receptor is a G protein–coupled receptor. The receptors are named for, and differentiated by, other molecules that bind to them. Whereas nicotine will bind to the nicotinic receptor, and muscarine will bind to the muscarinic receptor, there is no cross-reactivity between the receptors. The situation is similar to locks and keys. Imagine two locks—one for a classroom and the other for an office—that are opened by two separate keys. The classroom key will not open the office door and the office key will not open the classroom door. This is similar to the specificity of nicotine and muscarine for their receptors. However, a master key can open multiple locks, such as a master key for the Biology Department that opens both the classroom and the office doors. This is similar to ACh that binds to both types of receptors. The molecules that define these receptors are not crucial—they are simply tools for researchers to use in the laboratory. These molecules are exogenous, meaning that they are made outside of the human body, so a researcher can use them without any confounding endogenous results (results caused by the molecules produced in the body). The adrenergic system also has two types of receptors, named the alpha (α)-adrenergic receptor and beta (β)-adrenergic receptor. Unlike cholinergic receptors, these receptor types are not classified by which drugs can bind to them. All of them are G protein–coupled receptors. There are three types of α-adrenergic receptors, termed α1, α2, and α3, and there are two types of β-adrenergic receptors, termed β1 and β2. An additional aspect of the adrenergic system is that there is a second signaling molecule called epinephrine. The chemical difference between norepinephrine and epinephrine is the addition of a methyl group (CH3) in epinephrine. The prefix “nor-” actually refers to this chemical difference, in which a methyl group is missing. The term adrenergic should remind you of the word adrenaline, which is associated with the fight-or-flight response described at the beginning of the chapter. Adrenaline and epinephrine are two names for the same molecule. The adrenal gland (in Latin, ad- = “on top of”; renal = “kidney”) secretes adrenaline. The ending “-ine” refers to the chemical being derived, or extracted, from the adrenal gland. A similar construction from Greek instead of Latin results in the word epinephrine (epi- = “above”; nephr- = “kidney”). In scientific usage, epinephrine is preferred in the United States, whereas adrenaline is preferred in Great Britain, because “adrenalin” was once a registered, proprietary drug name in the United States. Though the drug is no longer sold, the convention of referring to this molecule by the two different names persists. Similarly, norepinephrine and noradrenaline are two names for the same molecule. Having understood the cholinergic and adrenergic systems, their role in the autonomic system is relatively simple to understand. All preganglionic fibers, both sympathetic and parasympathetic, release ACh. All ganglionic neurons—the targets of these preganglionic fibers—have nicotinic receptors in their cell membranes. The nicotinic receptor is a ligand-gated cation channel that results in depolarization of the postsynaptic membrane. The postganglionic parasympathetic fibers also release ACh, but the receptors on their targets are muscarinic receptors, which are G protein–coupled receptors and do not exclusively cause depolarization of the postsynaptic membrane. Postganglionic sympathetic fibers release norepinephrine, except for fibers that project to sweat glands and to blood vessels associated with skeletal muscles, which release ACh ([link]). Signaling molecules can belong to two broad groups. Neurotransmitters are released at synapses, whereas hormones are released into the bloodstream. These are simplistic definitions, but they can help to clarify this point. Acetylcholine can be considered a neurotransmitter because it is released by axons at synapses. The adrenergic system, however, presents a challenge. Postganglionic sympathetic fibers release norepinephrine, which can be considered a neurotransmitter. But the adrenal medulla releases epinephrine and norepinephrine into circulation, so they should be considered hormones. What are referred to here as synapses may not fit the strictest definition of synapse. Some sources will refer to the connection between a postganglionic fiber and a target effector as neuroeffector junctions; neurotransmitters, as defined above, would be called neuromodulators. The structure of postganglionic connections are not the typical synaptic end bulb that is found at the neuromuscular junction, but rather are chains of swellings along the length of a postganglionic fiber called a varicosity ([link]). Fight or Flight? What About Fright and Freeze? The original usage of the epithet “fight or flight” comes from a scientist named Walter Cannon who worked at Harvard in 1915. The concept of homeostasis and the functioning of the sympathetic system had been introduced in France in the previous century. Cannon expanded the idea, and introduced the idea that an animal responds to a threat by preparing to stand and fight or run away. The nature of this response was thoroughly explained in a book on the physiology of pain, hunger, fear, and rage. When students learn about the sympathetic system and the fight-or-flight response, they often stop and wonder about other responses. If you were faced with a lioness running toward you as pictured at the beginning of this chapter, would you run or would you stand your ground? Some people would say that they would freeze and not know what to do. So isn’t there really more to what the autonomic system does than fight, flight, rest, or digest. What about fear and paralysis in the face of a threat? The common epithet of “fight or flight” is being enlarged to be “fight, flight, or fright” or even “fight, flight, fright, or freeze.” Cannon’s original contribution was a catchy phrase to express some of what the nervous system does in response to a threat, but it is incomplete. The sympathetic system is responsible for the physiological responses to emotional states. The name “sympathetic” can be said to mean that (sym- = “together”; -pathos = “pain,” “suffering,” or “emotion”). Watch this video to learn more about the nervous system. As described in this video, the nervous system has a way to deal with threats and stress that is separate from the conscious control of the somatic nervous system. The system comes from a time when threats were about survival, but in the modern age, these responses become part of stress and anxiety. This video describes how the autonomic system is only part of the response to threats, or stressors. What other organ system gets involved, and what part of the brain coordinates the two systems for the entire response, including epinephrine (adrenaline) and cortisol? The primary responsibilities of the autonomic nervous system are to regulate homeostatic mechanisms in the body, which is also part of what the endocrine system does. The key to understanding the autonomic system is to explore the response pathways—the output of the nervous system. The way we respond to the world around us, to manage the internal environment on the basis of the external environment, is divided between two parts of the autonomic nervous system. The sympathetic division responds to threats and produces a readiness to confront the threat or to run away: the fight-or-flight response. The parasympathetic division plays the opposite role. When the external environment does not present any immediate danger, a restful mode descends on the body, and the digestive system is more active. The sympathetic output of the nervous system originates out of the lateral horn of the thoracolumbar spinal cord. An axon from one of these central neurons projects by way of the ventral spinal nerve root and spinal nerve to a sympathetic ganglion, either in the sympathetic chain ganglia or one of the collateral locations, where it synapses on a ganglionic neuron. These preganglionic fibers release ACh, which excites the ganglionic neuron through the nicotinic receptor. The axon from the ganglionic neuron—the postganglionic fiber—then projects to a target effector where it will release norepinephrine to bind to an adrenergic receptor, causing a change in the physiology of that organ in keeping with the broad, divergent sympathetic response. The postganglionic connections to sweat glands in the skin and blood vessels supplying skeletal muscle are, however, exceptions; those fibers release ACh onto muscarinic receptors. The sympathetic system has a specialized preganglionic connection to the adrenal medulla that causes epinephrine and norepinephrine to be released into the bloodstream rather than exciting a neuron that contacts an organ directly. This hormonal component means that the sympathetic chemical signal can spread throughout the body very quickly and affect many organ systems at once. The parasympathetic output is based in the brain stem and sacral spinal cord. Neurons from particular nuclei in the brain stem or from the lateral horn of the sacral spinal cord (preganglionic neurons) project to terminal (intramural) ganglia located close to or within the wall of target effectors. These preganglionic fibers also release ACh onto nicotinic receptors to excite the ganglionic neurons. The postganglionic fibers then contact the target tissues within the organ to release ACh, which binds to muscarinic receptors to induce rest-and-digest responses. Signaling molecules utilized by the autonomic nervous system are released from axons and can be considered as either neurotransmitters (when they directly interact with the effector) or as hormones (when they are released into the bloodstream). The same molecule, such as norepinephrine, could be considered either a neurotransmitter or a hormone on the basis of whether it is released from a postganglionic sympathetic axon or from the adrenal gland. The synapses in the autonomic system are not always the typical type of connection first described in the neuromuscular junction. Instead of having synaptic end bulbs at the very end of an axonal fiber, they may have swellings—called varicosities—along the length of a fiber so that it makes a network of connections within the target tissue. The heart rate increases to send more blood to the muscles, and the liver releases stored glucose to fuel the muscles. The endocrine system is also responsible for responses to stress in our lives. The hypothalamus coordinates the autonomic response through projections into the spinal cord and through influence over the pituitary gland, the effective center of the endocrine system. Which of these physiological changes would not be considered part of the sympathetic fight-or-flight response? Which type of fiber could be considered the longest? Which signaling molecule is most likely responsible for an increase in digestive activity? Which of these cranial nerves contains preganglionic parasympathetic fibers? Which of the following is not a target of a sympathetic preganglionic fiber? In the context of a lioness hunting on the savannah, why would the sympathetic system not activate the digestive system? Whereas energy is needed for running away from the threat, blood needs to be sent to the skeletal muscles for oxygen supply. The additional fuel, in the form of carbohydrates, probably wouldn’t improve the ability to escape the threat as much as the diversion of oxygen-rich blood would hinder it. A target effector, such as the heart, receives input from the sympathetic and parasympathetic systems. What is the actual difference between the sympathetic and parasympathetic divisions at the level of those connections (i.e., at the synapse)? The postganglionic sympathetic fiber releases norepinephrine, whereas the postganglionic parasympathetic fiber releases acetylcholine. Specific locations in the heart have adrenergic receptors and muscarinic receptors. Which receptors are bound is the signal that determines how the heart responds.